Edit: most of the time, liturgical abuse and bad taste are interlocked. (Rome) A liturgical blooper happened in the suburbican parish of Palestrina last Holy Thursday. 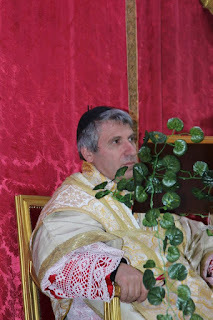 In the parish of the Assumption of the 50-year-old parish priest Fr Antonino Costa celebrated Holy Thursday liturgy in the garb of a prelate or abbot. On what, exactly was the excavated privilege he appealed to for this, nobody really knows. Roiate, a village of 750 inhabitants, picturesquely situated southeast of Rome, on the slope of Ernici can look back on an impressive history. Since the 4th century, the town belongs to the Diocese of Palestrina. St. Benedict of Nursia is said to have left here a footprint in the rock on which the parish church is built. Many pilgrims flocked to it earlier times, therefore.Over the centuries, the foot print is "sweating" again. Popular piety saw it as a "bad omen" for the future. A drop of fluid emerging from the rock has been collected and used for the last rites of the dying. In the past century the rock is said to have only "sweat" three times, in connection with the First and Second World War and the earthquake in Irpinia in 1980. The name of Roiate has its origins in the Lombards, who came in 568 to the country and played a role here - at least some of their noble families - until the High Middle Ages. In 962, Emperor Otto I gave the town rights. The same emperor confirmed in 967 the already ancient territorial dominion of Benedictine Subiaco. But the secular rule of Subiaco was ended in 1753 by Pope Benedict XIV., and Roiate fell to the direct management by the Congregatio boni regiminis of the Roman Curia. All this is not sufficient to explain the "Prelatization" of the pastor. Roiate was the scene of a bizarre spectacle on Holy Thursday the past few weeks. 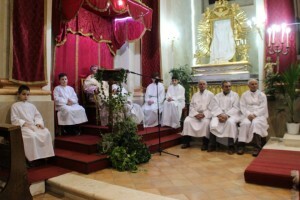 Don Costa had built a huge canopy and a throne on which he sat during the liturgy. His rise in rank, he expressed by wearing a Rockett and a dalmatic under the chasuble, as is customary for bishops and abbots. All this may be irritating and doubtful, but the real problem it is not. "The liturgical pastiche connected to it is unacceptable," said Messa in Latino . Don Costa had erected a square table in the sanctuary, where he set up a plasticated Last Supper, in which "plastic" is to be taken literally in the transferred sense. 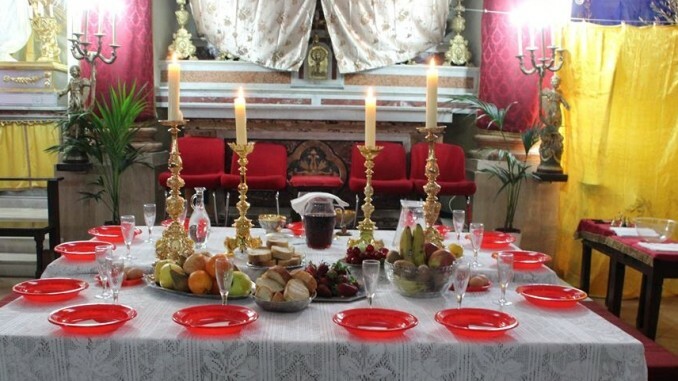 Besides, magnificent candlesticks stood beside the twelve red plastic plates on the table, which was stocked as well with all kinds of fruit filled cups, a plate of sliced ​​bread, a carafe of red wine and two cups [sic] with hosts. The pastor did not celebrate Missa in Cena Domini at the altar, but at this strange draped table. "In the colorful Catholic world we had already seen it all. What in the infinite collection of liturgical abuses is still missing, the blood of Christ was served "in champagne glasses," so Messa in Latino .The "prelatized" pastor did not use a chalice for the Eucharist, but a glass of champagne, which he elevated over the plastic plates and the fruit. On the website of the Diocese of Palestrina the Liturgical Office writes that it was his duty, " to promote a deeper understanding of the immense treasure of liturgical rites and the liturgical magisterium, according to the tradition of the Church and in obedience to the Holy Spirit to promote." "The pity is that this in-depth unders'tanding' in Roiate seems not yet arrived," said Messa in Latino . There will be Rabbis and Imams leading the neo-catholic liturgical garbage soon. The End. Deo Gratias. I can't fathom how Our Lord could subject Himself to such abuses. That alone argues against the validity of the new mass. A priest's intention has to be in accord with what the Church has always done regarding a Sacrament. I can't fathom how our Lord allowed his body to be treated with such violent profanity in the Praetorium and on Calvary. 'I dont know how Our Lord could subject himself to such abuses.' Are you serious ? What about the Crucifixion ! Are you two serious? Christ came into the world to show His love by redeeming us with His Passion. This He longed for, this He desired from the beginning. It's quite a different thing for Jesus to be insulted, scourged and crucified anew. The True Mass honors Christ and His Sacrifice. The new mass contains words that are odious in His sight. And that is in the best of the best cases. To demonstrate to what extent He loves humanity ,and that they will have no excuse for rejecting his Love and Redemption. God is patient He has eternity to deal out Justice,he is not bound by time. It's worse, a deliberate attempt to pablumize and trivialize real religious feelings and objective reality. Mr Bergoglio would approve of the plastic plates, champagne glasses, fruit, bread and stuff: this would fit in with the feet-washing débâcle. Mr Bergoglio would most certainly not approve of the rochet (sic), dalmatic, tunicle or whatever other pontificals this nutter had taken to himself. What a jolly wheeze! Glad to be out of it! Cling to the Barque of Écône! To me it is quite obvious that this man has gone mad and that all those who participated in this blasphemous charade have gone mad too! And all those who condone this madness are also insane! I'm sure POPE Bergoglio would approve of these things were it in the interests of liturgical play. I would assume that this "pastor" is severely mentally imbalanced by his actions. My Uncle, who has been a member of one of the major news networks for 42 years (and will retire soon), told us one time that in Paris (around 1978), he stopped into a Church for what he though was a normal Mass, but that part of the ceremony at the consecration was for a line of little boys to come out holding lighted candles....naked...dressed as cherubs with angels wings attached to their backs. So that this sick garbage has gone on for a long, long time. Around 1968/1967 a 'priest' started his sermon by ripping a Holy Rosary in pieces while yelling (talking loudly with an angry irritable tone) "NO MORE OF THIS!!!" 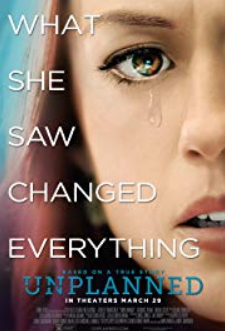 After learning about Demons writhing and screaming during exorcisms just at the name of our Blessed Mother Mary,this story/moment in time,took on a even more sinister edge. Yes, and you are missing the point. The Church also must go through her passion just like her Lord, and it is that which we are witnessing. The Lord will put up with a lot before the hammer falls in order to save more of those souls which he loves and has been crucified for. Ps. Jesus is insulted and scourged anew every day by sin and sinners. It's been going on for centuries. It doesn't make it right but it is true.